In contemporary art museums where web sites are captured as collection material, where sculpture is food and you're supposed to eat it, having a Media Arts Department and a curator of electronic art seems mainstream. Nevertheless, the San Francisco Museum of Modern Art is one of only a handful of museums in this country whose commitment to electronic artworks includes a Department of Media Arts. The Department was established, under the curatorial guidance of Bob Riley, a little over ten years ago, when the video image was only thirty years old and since then has developed a collections care system to meet the very specific needs of electronic art. Conservation and contemporary art - the subtle, and often not so subtle, distinctions between conservation of contemporary materials and works of art from previous centuries have been thoughtfully discussed by many. A quick review of some of these distinctions is a good preface to an explanation of the care required for Media Arts. With contemporary art, of course there are the challenges of modern artist materials and the unorthodox, yet defining, issues of artist intent. Increasingly in museums, overlap or a certain "blur", if you will, in fine art mediums leaves curators and conservators stepping on each others' toes programmatically (it is interesting to note that all of the curatorial departments at SFMOMA--Paintings & Sculpture, Photography, Architecture & Design, and Media Arts--have collected or displayed electronic materials in the last ten years). Finally, perhaps contemporary art's most compelling challenge to the traditions of conservation is that the art is not necessarily a tangible object. The work of Sol Lewitt or Robert Gober provide examples of this challenge to the notion of actual art objects. With works by both of these artists, the idea is acquired. There may be no storage location. If there is, the objects stored there do not, alone, comprise the art. The works are site specific installations. They require what we refer to as an institutional memory; that is, an accurate account of the experience of the art from which it can be faithfully recreated at any time in the future. Similarly with Media Arts, a work is typically "staged" as an installation of electronics. Often, these installations involve the most compelling uses of new technologies--sometimes, involving custom electronics which have been engineered specifically for an artist's idea. These electronic installations are not easy to categorize and store. They usually involve videotape, the equipment to play the tape, and there is almost always specific architecture that is built as part of the artwork. These works of art need to be put in a gallery according to the artists' specifications. In the end, what you have is a very detailed plan for a particular piece. So where does that go? Does that plan belong in paper storage? Does it stay in the curator's office? What is the art? Is the equipment required to run the piece considered "stock"? Is it dedicated to the piece? What happens when equipment parts break? What happens when the equipment is no longer available? If only the challenges of preserving electronic art stopped with preserving the videotape itself. While the SFMOMA Media Arts curator's role has included all aspects of preservation, it is Media Arts program assistants who assume responsibility for the host of details--the care, installation, maintenance, and tracking of components which comprise the artwork. Their job is part installation, part registration, and part conservation. Increasingly, registrars and conservators have played a role in ensuring the long-term care of the electronic holdings. Procedures for tracking condition and recording damage have become a regular part of collection maintenance routines. The SFMOMA collections management database, Embark, which has been used to locate and track components of an installation has now been expanded to include all aspects of condition. A hard copy file for each installation contains, among other things, installation plans, detailed condition notes and the exhibition history for a given object. Surveys of collection material ensure that the condition of an installation's components are being frequently reviewed. Recently implemented policies ensure that submasters are made for each video tape acquired at the time of its accession. In that way, tried and true conservation and registration practices have contributed significantly to our methods of long-term care. And yet when it comes to actually "fixing" electronic art, there is a new paradigm for conservation. Not unlike the work of Sol Lewitt or Robert Gober, the fundamental issue of conservation, here, is to preserve the institutional memory of a piece and to use that memory to recreate it at any time in the future. What that means in practice, for example, is that in some cases there may an unwavering commitment to the original format or equipment and in other cases the informed choice involves treatment that allows more evolved technologies to succeed the original. It is a decision making process we do not take lightly and one which involves the opinions of our curator and program assistant, registrars, and conservators. As the following two case examples illustrate, the guiding principle is to preserve the "experience" of the artwork. Mary Lucier, Dawn Burn - Mary Lucier is a seminal figure in the history of video installation art. Dawn Burn is a work that exploits the time-based aspect of video both in it's linear nature and in the very way that the apparatus degrades through continuous use. The sun rising over the Hudson river was recorded over seven days on seven separate videotapes and the burn left in the camera tube by the intensity of the sun deepens and lengthens over each subsequent tape. Consequently a record or "memory" of images and events is left not just on the videotape but is scarred directly into the recording apparatus itself. The video channels are played back on seven monitors arranged in obelisk pedestals to display this both continuous and discontinuous "memory". When it was entered into the museum's collection in 1991, Dawn Burn was in danger of being lost to the public record. The original open reel videotapes were never stored under ideal conditions and had consequently fallen into an unfortunate state. 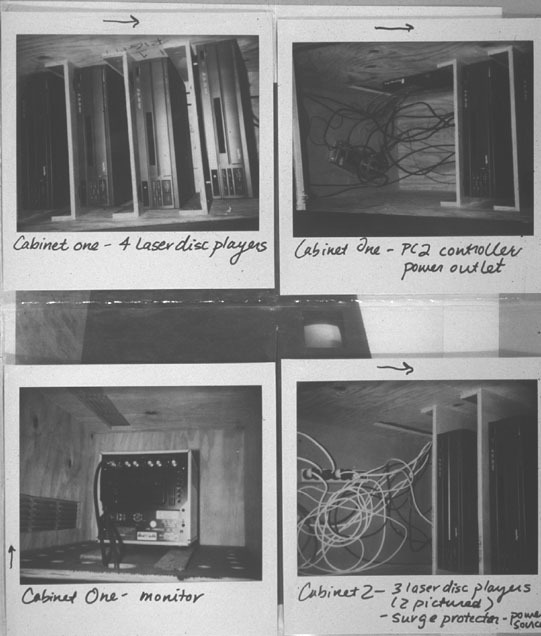 The video monitors and pedestals originally used were never saved with the piece, and a specific accurate plan was not made to document the installation. These are normal circumstances due to the high cost of installing and presenting video sculpture. The high end equipment, storage and archive facilities that are commonplace to mainstream media and even some museums are not only inaccessible to the independent gallery but are outside their purview as temporary art spaces. As one of his first major undertakings as Media Arts curator, Bob Riley organized the efforts of SFMOMA staff and the Bay Area Video Coalition, along with the artist, to reconstruct Dawn Burn to its intended state. The videotapes were restored in order to create new 1 inch "master" tapes to be preserved in the museum's vaults and from which laser discs could be pressed. New equipment and display apparatus were carefully researched, purchased and modified to achieve the appropriate visual quality. A video synchronization and automation system was designed to operate the piece and keep it up and running through long museum exhibitions. And finally we achieved a redesign and reconstruction of the piece that is as faithful to the original as possible. This was a historic moment for the preservation of video installation art but certainly not the end of the story. It would be dangerously counterproductive to assume at this point that the work was "rescued" and preserved for all time. Even an ambitious museum exhibition schedule is no match for the rapid rate of change in these video technologies. It would be seriously risky to wait until the piece is next scheduled for display to determine its condition. The laser discs will most likely deteriorate, the laser disc players are already approaching obsolescence. Even the video monitors which have been a technological constant since the invention of television will become unusable as digital tech-nologies overwhelm the broadcast and consumer markets. New discs, perhaps Digital Versatile Discs, perhaps digital files delivered straight from the museum's central computer server or perhaps something as yet unimagined, will need to be made and along with them new types of players or other hardware will need to be bought. Various types of advanced video imaging devices will need to be considered to replace the monitors and a whole new wiring and synchronization plan will need to be engineered. The actual technology employed is not particulary significant--as long as the image is restored, as long as the piece has the same look, feel and intent of the original. Will we know what that is in 100 years, and if so, how will we know? This is where the SFMOMA Media Arts department has tried to create what we call an "institutional memory" for preserving the permanent collection's electronic artworks. Along with the meticulous care that is put into storing the materials of the piece, we have devoted an enormous amount of attention to the storage of information necessary to reconstruct the piece each time it is to be shown. New architectural diagrams were made along with photographs and written descriptions, wiring plans and precise lists of all the components and how they were constructed or acquired. This information was carefully archived in a book that we keep for each electronic art installation. Howard Fried, 1970 - Howard Fried is a Bay area artist known for his rigorously developed conceptual installations. He often works with electronic media as a component in his works but is not necessarily identified as a film or video artist. 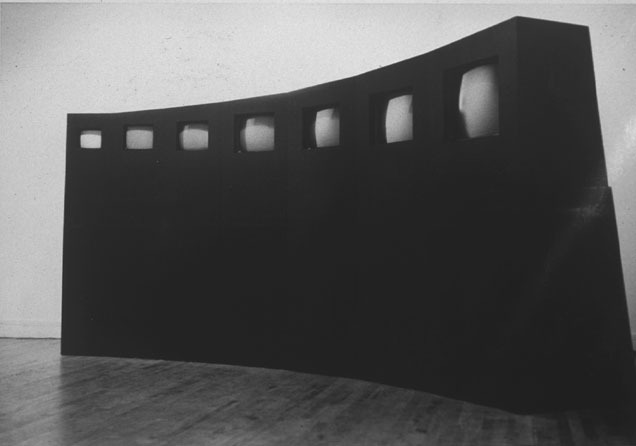 In this installation entitled, 1970 , an 8mm cartridge-type projector, commonly used at the time, is mounted in the space and its film is projected onto a freestanding column. The image projected is of the first 1,970 names from a baby name book animated to resemble a fast moving odometer. This is derived from the often heard complaint at the time that people were being turned into numbers. When the piece was shown at SFMOMA in 1990, and subsequently entered into its collection, the artist was directly involved in the design of the installation as it requires a number of site-specific conditions. The necessary continuous-loop projector and a spare were acquired and several prints of the film were made and loaded into cartridges. A mount for the projector was constructed to hang in the doorway and a column was designed and placed in direct relation to the size of the room and the projected image. When the piece was scheduled to be shown again in January 1997 in the new SFMOMA building, the entire design of the piece needed to be redeveloped. The dimensions of the galleries were completely different and the meticulously designed projector mount was no longer appropriate for the new doorway. Therefore, a simple wall shelf was built for the projector. Additionally, a plan was made, with complex mathematical formulas and diagrams, to determine the size and placement of the column and the projected image in any size gallery, and new prints of the film and cartridges were made. Fortunately, the artist was still available and could be called upon to assist with the new installation. When employing obsolete machinery, such as a continuous-loop projector, one must be prepared for the type of problem that we faced during this most recent exhibition in 1997. A few days after the show opened, the projector stopped running and no amount of cajoling would start it again. It was sent out to be repaired and the spare projector was put in its place. The spare stopped working within a day. The problem was isolated to the cam gear which pulls the film through the projection gate. Replacement gears were harvested out of a found stockpile of old, but unused, projectors. After the lengthy process of locating and replacing the gears, the projectors were reinstalled. Unfortunately they continued to fail faster than they could be fixed. After strenuous debate, it was decided that, in this case, there is a commitment to keeping the existing equipment in working order. If a different type of film loop projector were acquired, it would be antiquated too and, most likely, plagued with similar problems. Converting the whole piece to a video format was also rejected. The electronic equipment used may not be fundamental to the original intent of the work. If sophisticated video projection technology was available in 1970 the artist may have used that instead, but this technology is fundamental to how the piece looks and sounds. These aesthetic concerns are preserved for historic purposes and also because the leap from film to electronically projected image is traditionally seen as vast and philosophically very tricky. 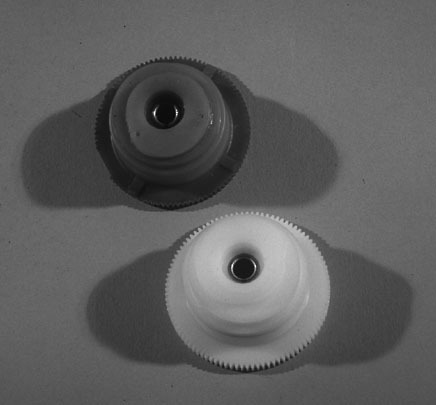 With the help of several engineers, machinists, and projector repairmen new gears were constructed out of Delrin, a type of plastic, and refitted into the projectors. After this process the piece ran continuously until the end of the exhibition. Old technology was restored--"re-created". In the future, new film prints will need to be struck, new gears, belts, and lamp housings will need to be machined to preserve the piece at least until new technology is developed to deliver the artwork with the original intention. At that point, decisions among the conservators, curators and registrars, usually with the artist if he or she still available, will need to be made. These two installations provide good examples of what an art institution has to deal with when it takes on the responsibility of caring for electronic time based art especially in that they show that the problems will be as unique as the works themselves. We encounter works like Steina Vasulka's, The West and Jim Campbell's Digital Watch , in which the artists employ their own abilities as electronic engineers to construct custom electronic elements. They are complex devices that are made solely for these works and are designed to achieve very specific effects. Yet even these things can be preserved if the proper information is archived. Information such as electronic schematic diagrams, video documentation of the piece functioning, and even an interview with the artist describing her/his intent are fundamental to the long-term care of these works.